As part of the work to define the teaching and learning provision within the Spring Lane Building, we spent a lot of time working through the lecture theatre design. In particular, Dr Roddy Vann (Natural Sciences Programme Director) has been extremely active - especially within the Sciences community - to canvas views, test existing facilities and input into the type of provision required. A genuine challenge that we were unable to overcome within the Spring Lane Building theatre, given the size, was the writing board provision at the front of the theatre and visibility/legibility at the back. The working group concluded that it would not be possible to provide a high-quality learning experience with traditional writing boards that move up and down. Instead, we will pioneer new camera and board technology in the Spring Lane lecture theatre and project this using the two six metre wide projection screens that will be installed. A smaller ‘scribble’ board (a few meters in size and mobile) will be provided for smaller lectures where this may be useful. 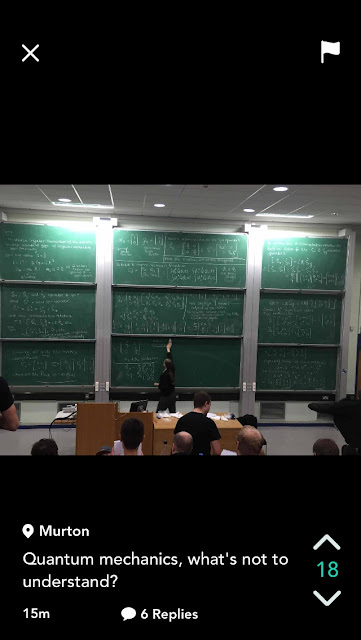 Many of our lectures that would ideally like a lot of teaching board real-estate are around the 150-250 size range and housed in other lecture theatres on campus. Feedback in some of these - notably the Exhibition Centre P/X/001, Derwent Hendrix Hall and Vanbrugh V/045 - is not always great for a number of reasons such as board surface wear, manual handling issues or lack of free movement (pressing a motorised button instead), or not enough board space. Acting upon this feedback, the Steering Group has recommended that these theatres are upgraded. We are happy to say, in adjusting the investment programme for this year, we will upgrade the boards in Hendrix Hall and install new boards in V/045 by the Summer! P/X/001 is a much bigger project, given the size of the room and the existing facilities. As such, it has been recommended to include this in the major works/capital programme for the next financial year as a ‘focused estates investment’ - looking at every element of the fabric of the space with a view to transforming the learning and teaching experience. Thank you for your feedback on this - and particular to Dr Vann who has passionately championed the cause.